A delegation from Shandong University of Finance and Economics (SDUFE) was at the University of New Brunswick (UNB) last week to launch a partnership with UNB’s department of economics. 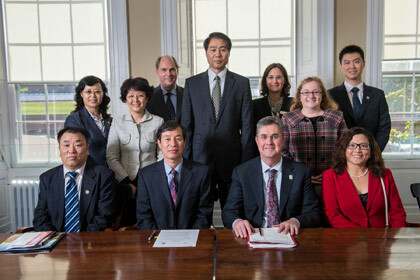 Officials from SDUFE were welcomed by UNB President and Vice Chancellor Eddy Campbell; Mr. David Hinton, registrar on the UNB Fredericton campus; and Dr. Weiqiu Yu, chair of economics at UNB Fredericton. The two institutions signed a five-year agreement to encourage the exchange of students, faculty members, and visiting scholars, and to facilitate inter-institutional study, research, faculty development and the sharing of the joint research interests. Founded in 1986, SDUFE is located in Jinan, China, and is recognized as one of Shandong Province’s top institutions.